1) How does Blake present the worm? 2) The Rose's Joy is - Crimson. 4) To the rose the worm is--- invisible. 5)' has found thy bed ' - - - The 'bed' refers to here is the bed of---- rose. 7) the 'worm' in the poem' The sick rose' is imagined as - - male. 10) The rose is sick because---- the dark secret love of worm destroyed its life. 1) what does the rose stand for? The rose stands for the innocence and purity of love. 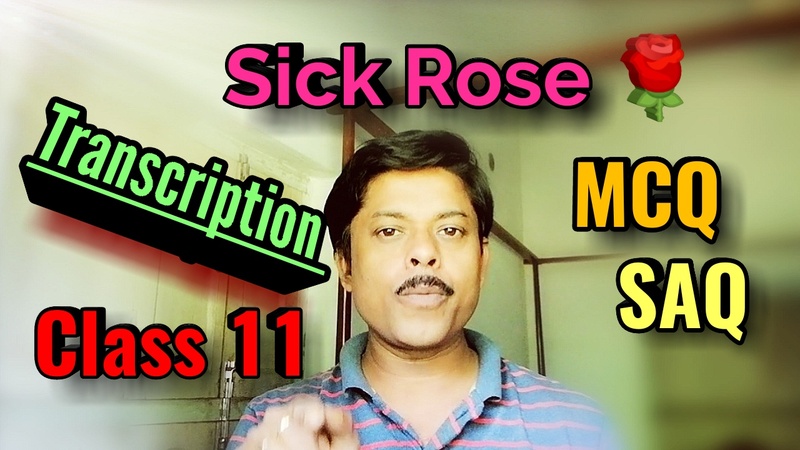 2) why is the rose sick? The rose is sick because an invisible worm is destroying its Core. 3) when did the worm creep into the roses bed? The worm crept into the roses bed in a night of howling storm. 4) what flies in the night of 'howling Storm' ? An invisible worm flies in the night of howling Storm. 5) whom does the poet address in the poem 'The sick rose'? The poet addresses the Rose in the poem 'The sick rose'. 6) To whom is the worm invisible? The worm is invisible to the rose. 7) whose bed has the worm found out? The worm has found out the bed of Rose. 8) whose Joy is referred to in the expression' Crimson joy'? The joy of the worm is referred to as 'Crimson joy'. The worm is invisible because it flies in the darkness of a Stormy night. 10) what does the worm in the poem' The sick Rose' stand for? The worm in the poem' The sick rose' stands for corruption through experience. 11) how does the poet describe the love of the worm? The poet describes the love of the worm as dark and secret. 12) how is the night when the worm in the poem 'The sick Rose' flies? the worm flies in the night of howling storm. 13) what colour is the worm's joy? The colour of the worm's Joy is Crimson. 14) who is the writer of the poem' The sick rose'? William Blake is the writer of the poem' The sick rose'. Hope you can understand all the questions and answers from here .